(PRLEAP.COM) November 20, 2018 - ThemeRex announced a Fall Sale of flagship WordPress themes. We know you were waiting for the great fall sale for a long time! 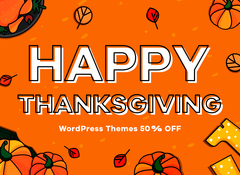 The much-anticipated Thanksgiving Holidays, Black Friday, and Cyber Monday always bring a bunch of special deal to the avid web design fans. This year is not an exception. 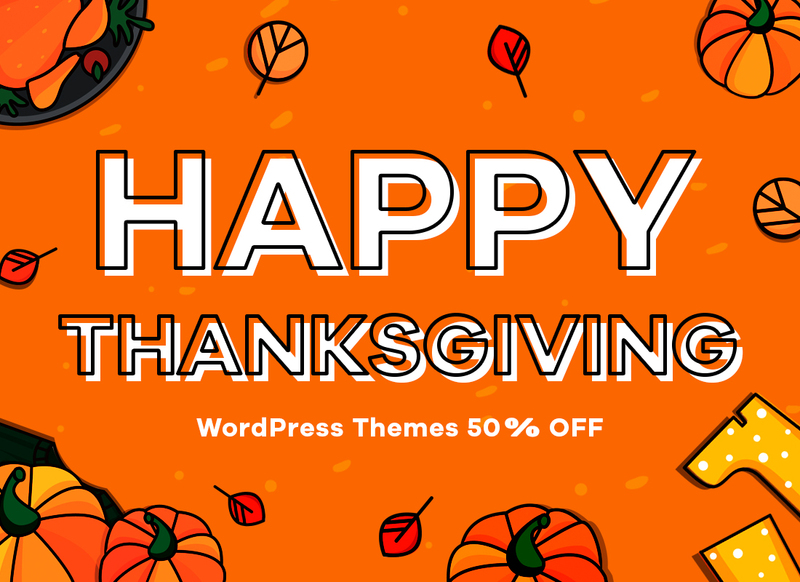 On November 20 - December 3, you are given a unique chance to save 50% on the 10 flagship WordPress themes that are listed below. It's up to you to decide how many of them you need. You can download 1 theme with a 50% discount or save half the price on all 10 items. It goes without saying that all themes are premium-quality designs that are built in accordance with the modern web standards. All of them are compatible with Gutenberg. Moreover, all themes are GDPR-ready and compatible with all the major extensions from WordPress inventory. So, take a look at the following showcase. Grab any theme that you like 50% off. Gutentype WordPress theme is based on Gutenberg page builder. This is the ultimate ready-made web design that is apt for niche blogs, business, cryptocurrency, and a bunch of other purposes. It contains a ready-made WooCommerce shop that allows you to sell any kind of products and services from the pages of your website. You can boost the performance of your future website with any plugin from the WordPress directory. Jacqueline WordPress theme is a ready-to-go product for beauty and massage salon websites. It is GDPR-ready and fully compatible with Gutenberg content editor. The theme comes loaded with a set of tools that are especially useful for websites related to the beauty industry. For example, the theme contains Booking Appointments, Pricing Tables, Gift Certificates, Events Management, and a number of other handy features. The theme is ready to be used for the launch of organic cosmetics websites. There are 5 pre-made homepage layouts being included in its download pack. It's made to be compatible with WPBakery, WPML, Essential Grid, WooCommerce, Revolution Slider, and a number of other popular WordPress extensions. The fully responsive layout of the template is ready to be modified in the intuitive visual mode. Drone Media - Aerial Photography & Videography WordPress Theme. If you want to build a new site or update the existing photography and videography online project, then Drone Media WordPress theme will just come in handy to you. The modern and functional design of the theme is 100% responsive and Gutenberg-ready. The theme is easy to customize without any special design or coding skills. All kinds of changes can be applied in the drag-and-drop interface. The theme is SEO-friendly and optimized for a flawless performance in all web environments. Select this theme to get launch a site for cryptocurrency, financial advisor, accounting or any other business project. It's based on the powerful ThemeRex framework. The download pack includes a bunch of tools and features that are suited to be used on financial and business sites. It makes extremely easy to sell your coins and accept donations in real money thanks to the integrated Give Donations plugin. Vagabonds is a ready-to-go WordPress theme that suits travel bloggers, writers, personal or professional magazines. The theme's layout is adjusted to handle content-rich online resources well enough. The theme contains a number of premium-quality plugins in its download pack. For example, you can use WPBakery page builder to modify the theme's content in the visual mode. WooCommerce plugin is added to let you sell services/products right from the pages of your site. Consultor WordPress theme is a ready-to-go solution for building sites of business consulting, investment advisors, tax assistants, etc. It is quick and easy to modify thanks to the integrated WPBakery Page Builder. The theme is SEO-friendly and fully responsive. It comes loaded with Contact Form 7, which is an integral element for any business and financial web project. The theme will come in handy to you if you need to launch a powerful and feature-rich cryptocurrency site. Also, it's well suited for a range of business, financial, and corporate web projects. The theme's download pack includes everything needed to sell coin and display current exchange rates. There is no need to worry about the way your site's content is displayed on different screens thanks to the 100% responsive layout. If you want to update your business site with a professional style, then PJ WordPress theme is the ultimate solution for you. It's Gutenberg-compatible and GDPR-ready. A powerful and fully responsive layout is apt for business advisors, consultants, agencies, etc. The theme comes loaded with 3 stunning pre-designed homepage layouts, advanced Events Management, Events Calendar, full WooCommerce support, etc. A modern and functional layout of this WordPress theme will is well suited for the launch of design and printing company sites. It is fully responsive and SEO-friendly. You may feel free to adjust the theme's layout as per your own needs in the visual mode. It is Gutenberg-ready. Thanks to the support of all the major WordPress plugins, you can boost the performance of your website just the way you wish. "Is there a theme that you think will suit your new blog, business site or web store ideally? Then go ahead and save 50% on the purchase! The process of site development can be more affordable and less time-consuming. Build a website using a feature-rich premium WordPress theme. Get a ready-to-go design that is compatible with the latest standards. Mind that it's a limited-time offer that expires on December 3!" – Henry Rise, founder of ThemeRex.